This recipe is originally from Pampered Chef. It’s great to make for parties, need a way to use up some chicken or need a quick dinner one night. Assorted toppings: shredded lettuce, sour cream, diced tomatoes, etc. Preheat oven to 425 degrees. In a medium bowl, combine chicken, onion, salsa, seasoning, garlic and lime juice. 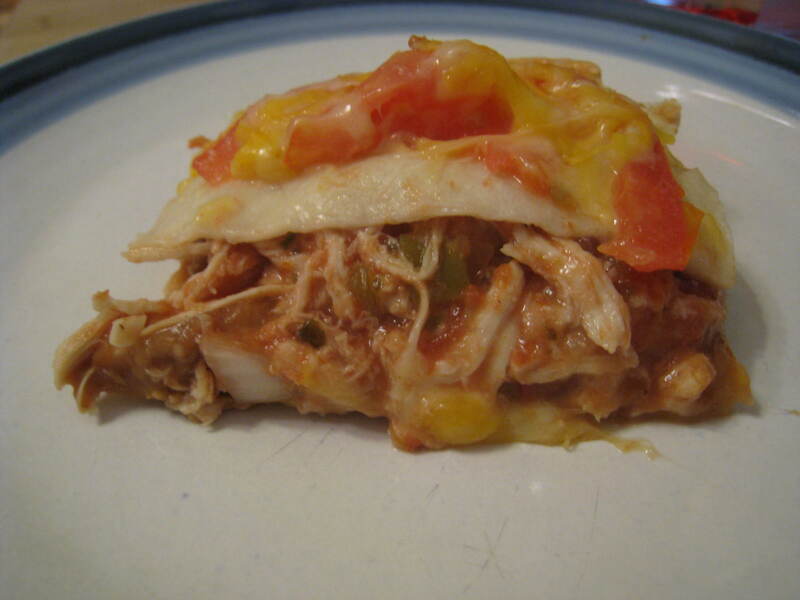 Microwave chicken mixture 3 to 4 minutes or until hot. Stir in 1/2 cup shredded cheese. Arrange tortillas in an overlapping circular pattern on a large stone/pizza pan covering the entire surface. Tortillas should extend over the end of the pan by 5 inches. Starting in the center, spread the refried beans over tortillas forming a 10×10 inch square. Spoon chicken mixture evenly over the beans. Fold edges of tortillas up over the chicken mixture in an envelope pattern. Arrange tomato slices in rows over the burrito. Sprinkle with the remaining cheese, covering the burrito completely. Bake 18 to 20 minutes or until cheese is melted an edges are browned. Cut into rectangles and serve with assorted toppings.